The Recent History of the Tower of London. John Wilkes, "that Devil Wilkes" as he was referred to by an indignant George III, was sent to the Tower in April, 1763. Popular amongst the people, he had spearheaded headed opposition to the government and the crown. Wilkes had dared to criticize George III in his political pamphlet, the North Briton and as a consequence, was committed to the Tower. He was to remain there for only a week until the government, responding to popular outrage, had to release him. 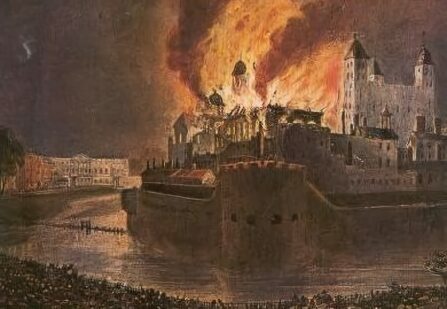 The 1841 fire at the TowerThe Tower of London experienced the worst fire in its long history on the night of 30th October, 1841. It commenced in the Bowyer Tower, where a flue had overheated and was first noticed at around half past ten. The Tower fire engines attended but the supply of water for them all could not be found. Engines from the city could not gain admittance past the guards at the Tower gates, the blaze spread quickly and began to engulf the Bowyer Tower. The flames lapped at the armouries and the storehouse by the Chapel of St. Peter ad Vincula. Although by this time further fire engines had been deployed, they were unable to get the now ferocious fire under control. The rapidly spreading flames began to engulf the Martin Tower, where the crown jewels were then stored. Alarmed efforts were made to save the priceless regalia from destruction. In the midst of the general panic, it was realized that the Keeper of the Jewel House had only the key to the outer room in his possession. The other key, to the barred cabinets themselves, was kept by the Lord Chamberlain. As the heat became increasingly intense, in attempt was made to bend the bars protecting the jewels with crowbars. One policeman bravely passed out the crown jewels, bearing heat so intense that his uniform was actually charred. The fire was not brought under control until 3 o'clock in the morning. By then it had destroyed the Bowyer and Brick Towers and the White Tower and the Chapel of St. Peter ad Vincula had both been damaged. An extensive programme of repairs and refurbishments was embarked upon in Victorian times by the Duke of Wellington, then Constable of the Tower. The Waterloo Barracks were built and Richard the Lionheart's now redundant moat was filled in with rubble and turned into a parade ground for the barracks. The Salt and Bowyer Towers were rebuilt. Repair work was also carried out on the Lanthorn, Well, Cradle and Broad Arrow Towers and to Traitor's Gate. The Victorian stone work can still be recognised. The present Tower Bridge is Victorian, being built in 1875. The White Tower and the ancient Chapel of St. Peter ad Vincula similarly underwent extensive renovation. During the restoration of the Chapel, the pathetic coffins of many of the mangled victims of Henry VIII's tyranny were exposed in the nave. Included amongst these were the skeleton of a woman of 'excessively delicate proportions' which is thought to be that of Anne Boleyn, or possibly Katherine Howard and that of an aged woman, clearly Margaret, Countess of Salisbury. Also uncovered was the skeleton of John Dudley, Duke of Northumberland, Lord Protector of the boy king, Edward VI, executed by Mary I, for his part in the usurpation of the crown in favour of his daughter-in-law, Lady Jane Grey, who along with his son Guildford Dudley, who was to become the pathetic young victim of his overriding ambition. All were reburied in the crypt. 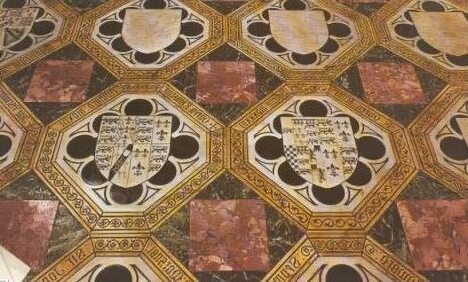 Queen Victoria had a green and red marble memorial pavement laid in the sanctuary, which has the names and coats of arms of all those executed by King Henry VIII who lie beneath. The chapel boasts some magnificent monuments, including that in the north west corner, to John Holland, Duke of Exeter, a Constable of the Tower, who died in 1447. It also contains a fine seventeenth century organ with carvings by Grinling Gibbons. 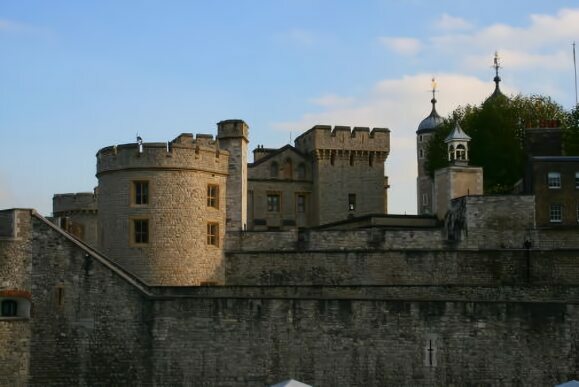 The Crown Jewels are stored at the Tower of London when not being used by the monarch for state occasions. 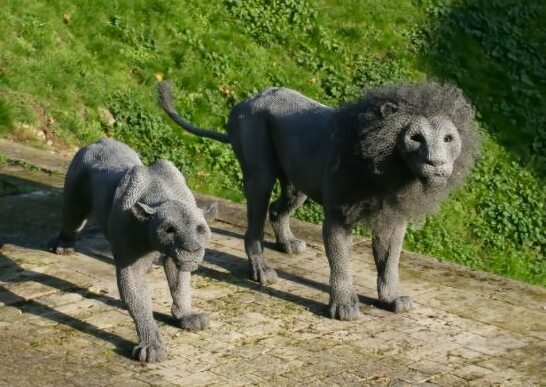 One of the main attractions of the Tower, they are kept in the Jewel House where they can be viewed by the public. Surprisingly, the Tower has featured in both World Wars of the twentieth century. Roger Casement, the Irish rebel was imprisoned at the Tower while awaiting his trial for treason after he was captured sailing for Ireland in a German submarine. He was sentenced to death by hanging on 29th June, 1916. During the Second World War, the Tower suffered damage from German bombers fifteen times, but fortunately the Medieval buildings escaped any severe damage. The Tower also hosted an infamous German prisoner, Rudolf Hess, Adolf Hitler's deputy. In attempt to make an offer of peace to Britain in 1941, he bailed out of an aircraft over Scotland, intending to contact the Duke of Hamilton, to gain access to the then Prime Minister, Winston Churchill or King George VI. Hamilton informed the government and Hess was sent to the Tower by Churchill. He was subsequently tried at Nuremberg. The Yeoman Warders are also known as beefeaters, the curious term is thought to have derived from the French word buttefier, who were guards in the palace of the French kings. The Yeoman Warders were established as bodyguards by Henry VII in 1485, following his victory at Bosworth Field. Today the beefeaters act mainly as guides for the tourists and conduct fascinating tours for visitors. The Warders still wear their scarlet and gold Tudor tunics, resplendent with ruffs, bonnets and knee breeches on state occasions. The blue 'undress' uniform is worn at all other times. 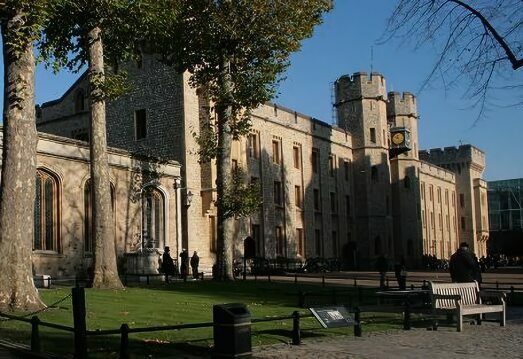 Many of the Tower's ancient ceremonies are kept alive, such as the Beating of the Bounds and the seven hundred year old Ceremony of the Keys, which still takes place for the benefit of tourists.